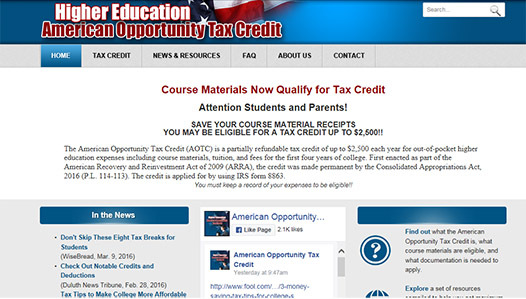 Course Materials Now Qualify for Tax Credit. SAVE YOUR COURSE MATERIAL RECEIPTS YOU MAY BE ELIGIBLE FOR A TAX CREDIT UP TO $2,500!! The American Opportunity Tax Credit (AOTC) is a partially refundable tax credit of up to $2,500 each year for out-of-pocket higher education expenses including course materials, tuition, and fees for the first four years of college. First enacted as part of the American Recovery and Reinvestment Act of 2009 (ARRA), the credit was made permanent by the Consolidated Appropriations Act, 2016 (P.L. 114-113). The credit is applied for by using IRS form 8863. You must keep a record of your expenses to be eligible!! To access the Higher Education American Opportunity Tex credit, please click on the link below. By clicking on the link below, you will temporary leave our website and be directed to the Tax credit site. By clickinig on the link below, you will temporary leave our website and be directed to the Tax credit site.